Your business is probably using at least one application. That might be something your team uses, such as a CRM, or it could be an app you built for your customers to log in and view their bills. While one application is relatively easy to manage, most businesses use apps for everything from communication (internal and external) to accounting to video conferencing, social media, and human resources. That doesn’t include any custom apps specific to your industry. Managing all of these apps may not seem troublesome; each department or person handles his or her own and business keeps moving as usual. But what if you want a clear picture of how things are going overall? Solution: An Internal Web Portal. 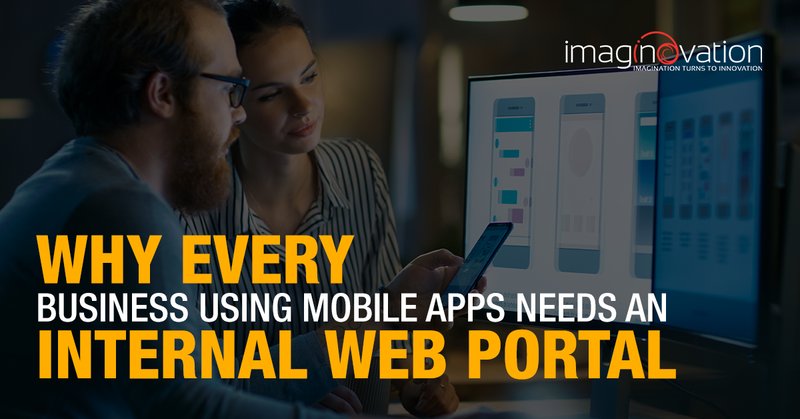 What is an Internal Web Portal? Many of Imaginovation’s clients request web portal development for their business applications. These apps serve either their team members or their clients — or even both. Some companies use multiple web-based service applications, such as SalesForce, an online accounting program, and more. But how do you manage all that data separately? A web portal is one way to bring it all together. A portal might check multiple spreadsheets, access the HR software, and manage items from Accounting. The portal is a way to have all that data in one place, with search, charts, and reports at your fingertips. A client with multiple sites needs a way to manage the maintenance of equipment at those facilities. Another needs to know where their trucks are and what they are carrying to determine if they have someone in Florida to take a new job on Wednesday. A mechanical engineering firm needs to have a way for engineers to pull CAD drawings and specs of the parts when making a design. A technical team uses iPads for field technicians to document installation with photos and descriptions while following detailed instruction. Why Use a Web Portal? Gives a clear picture – A portal will analyze for you and present information in charts and graphs. You can see where assets need to be allocated or get a complete picture of the company or department. One location – One place to sign in and access this information. Furthermore, if your company builds a custom app that is available for your clients or customers in the Apple Store or Google’s Play Store, you must re-submit to those stores each time you make a change to the code. Therefore, it is not wise to hard code values inside of your application. These include API endpoints, internal configuration details, etc. Instead, a web-enabled portal can set such values remotely. Through your portal, you can make changes to the application without having to re-submit to the app stores. Through the web portal, you can also build new features into the app, such as the ability to view user details or add target advertising. In the case of a consumer application, you might add coupon codes later, for example. Organize your apps for a clear picture of your company. Talk to us about building your custom portal.